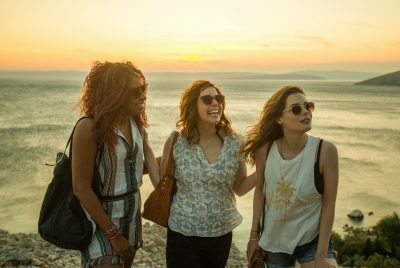 Netflix’s latest original feature film, Ibiza, utilised locations in Croatia as a double for its titular island. The production entered principal photography in September 2017, filming additional scenes throughout Serbia. Ibiza’s Location Manager, Tomislav Peleski explains: “we shot scenes for both Barcelona and Ibiza in Croatia and most exteriors were shot as they were, although set dressing in the streets was required to change the signs to feature the Spanish language. Aquarius club on Zrće beach (Pag island) was the key location for the Barcelona club, Aurora, as it resembles these huge party venues quite accurately. We shot a lot of Barcelona in Split and the the most iconic sunsets on Krk island which doubled for Ibiza. Our Production Designer Kevin Phipps and Art Director Dragan Kaplarević did a terrific job on recreating a secluded house with traditional Ibiza-style architecture on the Krk island." Croatia is a popular double for other Mediterranean locations, owed to its film-friendly infrastructure and 20% cash rebate on locally incurred production expenses. The Croatian island of Vis was recently used for Mamma Mia! Here We Go Again, enticing the production away from shooting in Greece. Serbia recently expanded its incentive programme to offer a 25% cash rebate, an increase over the previous 20% rate. The country also recently hosted production on Michael Noer’s remake of Papillon, alongside the pilot of Syfy’s Krypton.